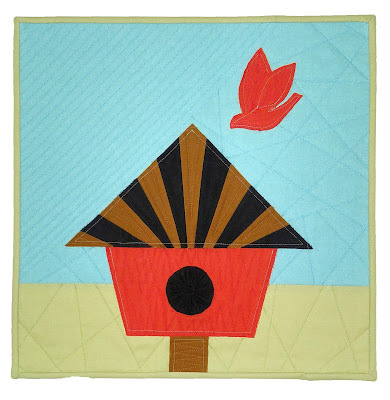 This is my submission for Curated Quilts' Mini Quilt Challenge for an upcoming issue featuring house quilts. This is "Bird House." It measures16" x 16." The actual colors are clearer and prettier than shown in this photo. It is machine pieced, machine appliqued, raw-edge appliqued, and machine quilted. The house door is a yoyo. You can see all of the wonderful quilts that have been submitted by clicking here. Thanks for posting the houses. I enjoyed looking and reading the names of each. Sew much fun.